Watching the debates around the EU referendum heat up as the date draws closer makes for a stomach-churning experience. Xenophobic voices are reaching a crescendo, while those of us who support open borders but are critical of the democratic deficit and free trade negotiations of the EU voice our alliances behind gritted teeth. It is even harder to witness for those who cannot vote in the referendum. Some of us, like me, are UK residents who don’t hold British citizenship, others are under 18 years of age. This means that those of us who arguably will be most affected by the outcome of the referendum do not have a vote in it. First of all, it is right and important to be critical of the EU as it currently operates. The EU is deeply flawed, in terms of its democratic deficit, the prospects of entering a free trade agreement in which corporations are entitled to sue governments, fiscal sanctions of member states and the cruel restrictions of ‘Fortress Europe’ on keeping its borders closed to those in need… The list is long, and I won’t go into the details here as that has been done elsewhere. Would the UK be better off outside the European Union in terms of protecting public goods and services, and the commons? Empty slogans like “taking back control” or “taking our country back” do not exactly constitute a vision for a fairer, more equal, ecologically wise alternative economic strategy to EU membership. As George Monbiot wrote, the current processes of rampant privatisation in the UK make it unlikely that in the case of Brexit the economic powers-that-be won’t enter similar or worse agreements. It might be a case of jumping from a frying pan into the fire: the neoliberal doctrine will burn us either way. Economic issues aside, it’s primarily the racism and xenophobia at the core of so much of the Leave campaign that worries me. A real “breaking point” was Nigel Farage’s disgusting poster, which UNISON reported to the policefor inciting racial hatred. Then in an unconnected event, Jo Cox MP was murdered in a fascist terrorist attack. We know from history that when anti-immigration fear mongering becomes common place, it has destabilising effects and can nurture extremist views. Violent incidents are a warning sign that we need to reevaluate the direction in which we’re headed. To build a more compassionate society, we must fight for more compassionate legislation regarding refugees and asylum seekers rather than tightening our borders. The Home Office’s immigration politics resulting in dawn raids, the detention and deportation of asylum seekers are a disgrace which by and large we share with other European countries. Yet proportionally, applications for asylum in the UK lie below the European average. Farage’s “breaking point” rhetoric would be laughable if it didn’t sow toxic seeds into so many hearts clouded by fear. I’ve lived, studied and worked in Scotland for 12.5 years, but I’ve retained my German citizenship. I originally moved here to study, which was possible under the EU membership regulations. During my first year or so in Scotland, I was part of a thriving community of international and Erasmus students, a perk of the open and fluid borders we share. I stayed on, studied some more, voted in Scottish and local elections and the independence referendum, worked for different community organisations in Glasgow, participated in grassroots politics and activism, and built family ties. I’m a UK tax payer and am told that I have a German accent with a Scottish twang. This is now my chosen home. When I’m back in Germany to visit family and friends, sometimes people assume that I’m a foreigner because I now “talk funny” in my native language. A European identity perhaps best captures and describes my experience these days. I’m very lucky to be a migrant and a foreigner by choice, knowing that this choice is open to all EU citizens. In fact, figures suggest that the number of EU citizens living in the UK is balanced by the number of Britons living abroad, which means that the Leave campaign’s rhetoric doesn’t add up. Our communities are diversified and enriched by migration. Yet the outcome of the referendum might close many doors for future generations who may no longer be able to enjoy the same fluidity and choices that many of us have taken for granted. The same future generations who can’t vote in the referendum may end up being deprived of their choices to enjoy the advantages of being a member of a diverse European community. For us EU citizens, this referendum feels deeply personal: even though the Leave campaign promised to grant those of us currently living in the UK the right to stay, we cannot be certain about the ways in which an EU exit would affect our lives. As a society, we have more to lose than to gain if we leave. The founding principles of the EU as an institution promoting and protecting peace between its member states have not lost their significance in the last 65 years. Resisting its flaws is also a common European project, and critical voices are getting louder. Last year for example, 250,000 people protested against TTIP in Berlin. The EU’s aforementioned democratic deficit makes it unlikely that a shift for the better will happen soon, and it’s not guaranteed that it will happen at all: so much for the gritted teeth. As a society, we have more to lose than to gain if we leave. The founding principles of the EU as an institution promoting and protecting peace between its member states have not lost their significance in the last 65 years. Resisting its flaws is also a common European project, and critical voices are getting louder. 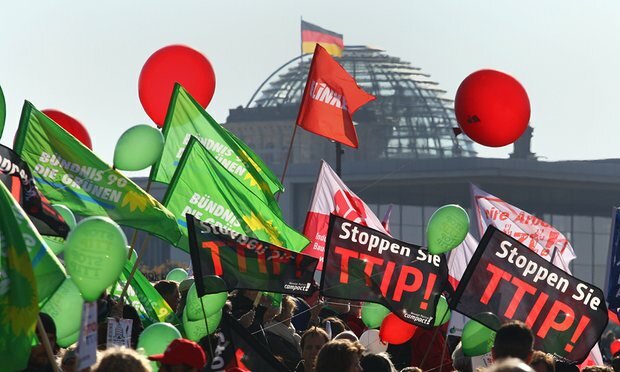 Last year for example, 250,000 people protested against TTIP in Berlin. The EU’s aforementioned democratic deficit makes it unlikely that a shift for the better will happen soon, and it’s not guaranteed that it will happen at all: so much for the gritted teeth. Nevertheless, if I could vote, I know I’d not be siding with those who advocate closed borders, closed-minded nationalism and xenophobia. Neither would many young voters – at least those over 18 who are not excluded from voting. Instead, let’s remain in the EU and pour our energies into renewed campaigns to reform it, and into nourishing values of diversity, compassion and tolerance to counteract the dangerous and xenophobic tendencies that pose the real threat, socially and politically. So if you have a vote in this referendum, please use it on Thursday! Young voters, rise up to the challenge to prove the polls wrong that predict your apathy! For those of you who are still undecided on how to vote in the referendum, or who consider not voting at all: please bear in mind how the outcome of this referendum will affect those of us who can’t vote in it, and cast your vote on our behalf. I find many, like yourself pandering to the masses that label the leavers Xenophobic and all the rest. I resist the temptation to call the remainers traitors to democracy, as a few on my side would have it. Yet again your’e piece is one to divide and polarise with the fig leaf of tolerance. So many words that mean nothing but point to your own discrimination. I do not have a problem with those that want to drag me in to a system that is set up to treat its citizens as a mere chattel for cooperate success. Only that they want to drag me with them, as they think they will need a rational voice in their ear when they realise exactly what they’ve done. In the next piece you write. please could you explain that there is at least one person out there that is neither racist xenophobic and all the rest. If you think that to be untrue just because I have disagreed with you then its you who has the issue. No … I doubt it …… so broaden your rhetoric to include the decent people on the leave side that are also trying really hard to make the right decision. Don’t keep demonising them. I think it quite a noble idea to vote for democracy myself and far too narcissistic to think that democracy in any event is ours to give away. If I don’t leave the youth democracy I have left them nothing. I see you don’t get that many comments. I comment, as this keeps popping up on a site that many look at and I feel your opinion needs some balance. You have no right to persuade young people to give up their democracy without explaining first what democracy is and what it brings. You are from a country that sits on a trade surplus of billions whilst it rubs the nose of Greece in to the dust. I presume you do not agree with policy. There is too much imbalance in the EU. It is designed like that … for the wealthy …. and cannot be reformed. By giving people back their voices you go some way to extinguishing the severe right wing elements. By stealing their democratic you just fuel it and even the moderates end up in that horrible place. History tells us that. That never ends well, so be more responsible with your rhetoric please. You don’t steal someones voice and expect them to go quiet. I take one point you make. I will certainly be voting on your behalf and voting to leave and hopefully saving democracy Europe wide. You can thank me later. Oh by the way, you need to get yourself informed about the Vienna treaties. It is international law that you are allowed to stay in the country so you don’t have to be coy about that fact anymore and can write that in your next piece. Perhaps before the vote ? Wouldn’t want anyone to be mislead with so much at stake would we. 250 thousand protested about ttip. WOW. The Med countries are on their knees screaming for reform. They are not heard. Immigration on such a scale is a serious issue. No one is listening. The fifth biggest economy in the world is about to tear itself away and still no reaction. Exactly how bad do things have to be before this institution decides to even consider reform … do you think ? Words are easy. If only the EU was what you think it is. You really think a few signatures from the chattels of the corporations that wrote that very document means they are going to take you seriously ? J. Cox by the way was a stalwart of, and for Democracy, so I find it somewhat hypocritical to use that issue for your cause. Not just cheap but totally misguided. You might recall this same thing happened in Sweden three days before their independence vote. It influenced the outcome, so don’t be irresponsible. If you don’t have a real argument , find one. Since that incident their have been a couple of rapes, savage attacks and murders, but you don’t seem to hold them in such high regard ? I cant imagine why. I’m not equating the Leave campaign with racism and xenophobia. Many decent folk will vote to leave the EU on Thursday. I’m only pointing out that there’s so much at the core of the Leave campaign, which ought to worry us. I’ve not come across any such tendencies in the Remain campaign, whatever personal opinions people who vote Remain might hold. I’m not “using the murder of Jo Cox for my cause”. I pointed out that it was a fascist terrorist attack which happened in a political climate that is increasingly bigoted and anti-immigration. The Leave campaign has condemned the murder after all. But the groundswell of xenophobia (which appears to be stronger in England than in Scotland) is fertile ground for extremist hatred. So yes, we should be worried, and do anything to counteract xenophobic rhetoric. Just like you, I am very critical of the EU, and I very much disagree with Germany’s treatment of Greece etc. But unlike you, I don’t believe that leaving will make things better for us all. I don’t believe that voting Leave will strengthen democracy for future generations; it’ll only limit their choices and options, and it’ll strengthen the voices crying out against immigration, which could take us further down a road we really, REALLY don’t want to go down. Well-said, Svenja. And great article! I’m an EU citizen in Glasgow as well, and I feel the same. You say in your reply to Davina Davey “I’m not equating the Leave campaign with racism and xenophobia”. Yet in your article you state (5th paragraph) “Economic issues aside, it’s primarily the racism and xenophobia at the core of so much of the Leave campaign that worries me. Nigel Farage’s disgusting poster, which UNISON reported to the police for inciting racial hatred, and the murder of Jo Cox MP in a fascist terrorist attack, mark a real “breaking point”: we’re headed in a direction where dangerous and violent bigotry is commonplace”. With regard to this conflation of ‘the poster’ and the ‘murder of Jo Cox’. I think this over steps the boundary of reasoned argument. You may agree with UNISON (that the poster incites racial hatred). However the image is a piece of photographic journalism. It is not an image of actors directed by a producer. Your subjective view is that it is offensive but it is also an accurate image of migrants and refugees trying to gain access to Europe. Point taken, the phrasing was misleading. In no way did I mean to blame the Leave campaign for the fascist terrorist attack. Hence that part has been amended. If possible can you please correct that spelling mistake in my last sentence. It should be ‘arguable’ not ‘arguably’. An invitation to vote for an EU that is offering a multi-million euro bung to the Turkish regime to limit both asylum seekers and economic migrants? And with other deals in the pipeline? A Remain vote is probably a more solid vote for anti-migration sentiment, the EU is already delivering action on the ground, including approving the closure of national borders. With Leave there is at least a small panglossian strand that believes in open borders and no welfare state. But the article generally thinks history started 65 years ago. How did we manage to have common languages, religion and cultures if borders were such barriers? That’s why Scottish nationalists dob’t fear the ceeation of a new nation-state, even though it will start life outside the EU. We have shared histories but lots of them involve wars! Yes the closure of EU borders is a huge problem, but the fact remains that the UK takes in far fewer refugees proportionally than many other European countries. Check out the graphs in the link provided! So voting remain is far more likely to lead to fairer arrangements. The Coal and Steel Community was founded to help stop the French and Germans having yet another war to find out who was top banana. So far, it seems to have worked. A totalitarian state as an immediate neighbour has probably helped. On refugees/migrants – these are very different things. What led the Germans to ignore their neighbours and grant admission was concern about refugees. What led the Germans to slam the doors shut (and turn a blind eye to the razor wire and start sending lorry-loads of euros to Turkey) was terror that they were going to be swamped by economic migrants. As Farage (!) accurately identified, they’d reached breaking point, and it only took a million people. A more rational approach to the refugee issue would have helped everyone apart from the people smugglers and even left the German political elite with some credibility with their neighbours. I don’t disagree with your criticism, but there’s not much use in finger pointing as long as you fail to explain how leaving the EU would help us, especially under a Tory government and with growing right-wing political sentiments among voters. We’d end up being far worse off. Your finger pointing was in relation to the “anti-immigration rhetoric” in the UK – which ignores reality in the rest if the EU. How many asylum centres have been burned down in Britain or Ireland? But voting to leave the EU now, in an orderly way, is the right move. The project will collapse anway. North Europeans aren’t going to pay for the pensions and healthcare of southern Europeans, and states are finding they are not really states if they don’t have control of their own borders. The breakup won’t be pleasant but Greece vs Germany parts I and 2 were just the opening rounds. There have been European allianes in the past and will be again but they will be between nation states, hopefully including Scotland, as that is the only stable form of national governance. If more EU citizens had voted Yes in 2014, we might not be having this debate. Hopefully we can convince more of them next time. I am surprised at the attachment to the European Union by some. I’d see it as one of several possible arrangementd between states. But some really see it as the end destination: a single state.